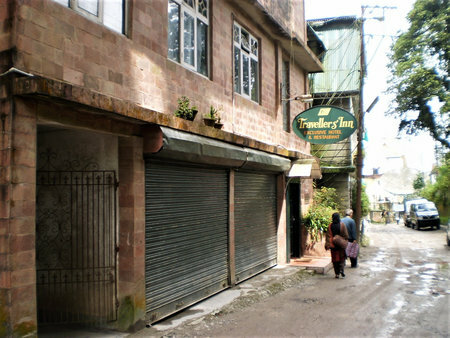 Travellers Inn is a small budget hotel located at a quiet place on a hill side. It's on Zakir Hussain Road, an uphill 15 minutes walk from the Chowrasta Mall area. The hotel is right on the road side. The entrance is through a small door. A staircase leads to the reception at the upper floor. 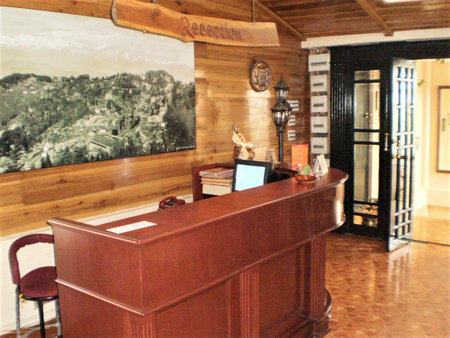 The reception area along with the corridor and even most of the rooms are wood paneled and thereby offering a cozy ambience. Travellers Inn is run by Ms. Sajda who is normally available at the front desk. In case she has gone out for personal work, the front desk is attended by Bibek, a local lad who also looks after the in-house restaurant. There are only 14 rooms in Travellers' Inn. There are Deluxe rooms with double or single occupancy, and Suit rooms that are good for families. 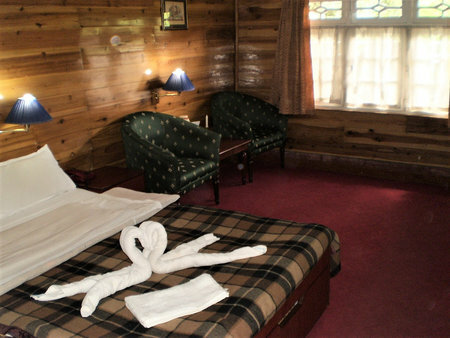 All rooms are on the same floor and are laid on both side of an impressive corridor. The corridor is fully wood paneled having nicely carved wooden beams on the ceiling. Some rooms face the roadside while the others (like room #105, 106 and 107) are view rooms from where you can get great views of the mountain range and the valley. Other than the suit or family rooms, the other ones are relatively small. Most of them however are pine wood paneled with slanted ceilings giving them a nice warm look. The rooms have Queen size or twin beds. 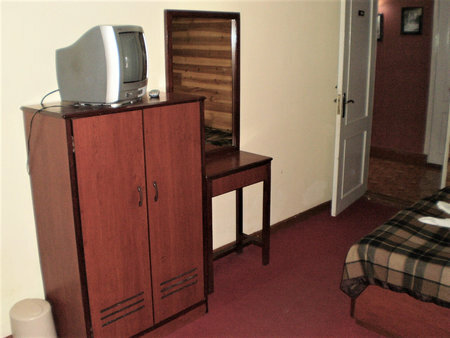 All rooms have standard amenities like TV with cable channels, cupboards, phones with direct dialing, carpets etc. Room heaters are provided at extra charge. There is a generator in the hotel which supports some of the essential lights in the rooms and common areas only after it's dark and till the dinner time. After that if there is power cut, they provide candles to light the rooms. This by the way is a common norm in budget hotels in Darjeeling. 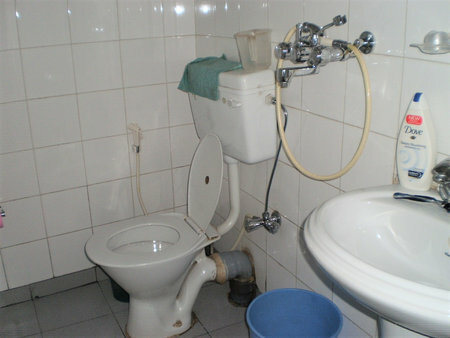 Bathrooms are of western style and have shower mixers. The hot water is available through the geysers from 7am to 9am only. There is a centralized power control which regulates the hot water and power in the rooms. However they do switch on the geysers if you request for hot water even beyond the scheduled time. One of the most impressive units of the hotel is its in-house restaurant. I am talking about the lay out of this long dining area which provides exceptionally wonderful views through large glass window panes on one side. The restaurant has sofa style seating that are separated in small cubicles by short glass partitions. 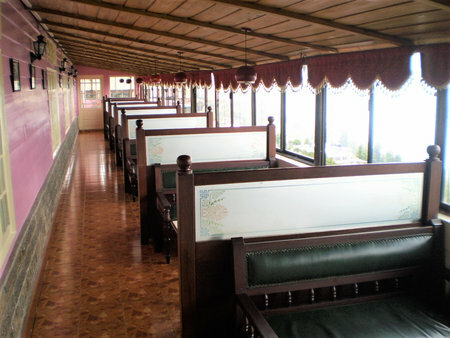 Overall an excellent place to dine while enjoying the breathtaking views of the mountain range and the valley. The restaurant serves Indian, Chinese and Continental dishes (both vegetarian and non vegetarian). They serve breakfast, snacks, lunch and dinner. The dinner ends at 9:30pm. The menu is fairly elaborate. In breakfast you will get corn flakes, toast, eggs to order, paratha, sandwiches, tea, coffee, milk, hot chocolate etc. Snack items include spring rolls, chats, pakora, cutlets etc. The lunch and dinner menus include soups of different types, Indian curry items including pulao and biryanis, and a range of Chinese dishes, all reasonably priced. Check out time is 12 noon. The hotel also has an annex building on Mall road known as Hotel Sailung providing rooms at economical rates. The hotel is off the Mall and in a quiet place. It will suit travelers wanting to be away from the noisy town center and enjoy the great views of the mountains. The restaurant and an open patio offers great scenic views. However you wont get such views from all the rooms. There are only few select rooms with great views. The hotel is in a walking distance from the Mall though. The hotel's interior is nicely done up. It's an overall clean hotel. The rooms along with bed sheets, towels and the linens are clean as well. They do daily housekeeping of the rooms which is unlike most of the budget hotels in its category. This is one of the very few budget hotels in Darjeeling where I have seen hand showers in the bathrooms and good quality (Dove) hand soap being provided. The service is nice and quite friendly. There is an internet connection from the PC in the front desk. So you can request them to allow you to check your mails when it's free. From the Chowrasta Mall, Travellers' Inn is an uphill walk for about 15 to 18 minutes along Zakir Hussain Road. As you walk up, the hotel will be on the right side of the road. Vehicles can up to this point from the other side. Zakir Hussain Road, Darjeeling 734 101, India.